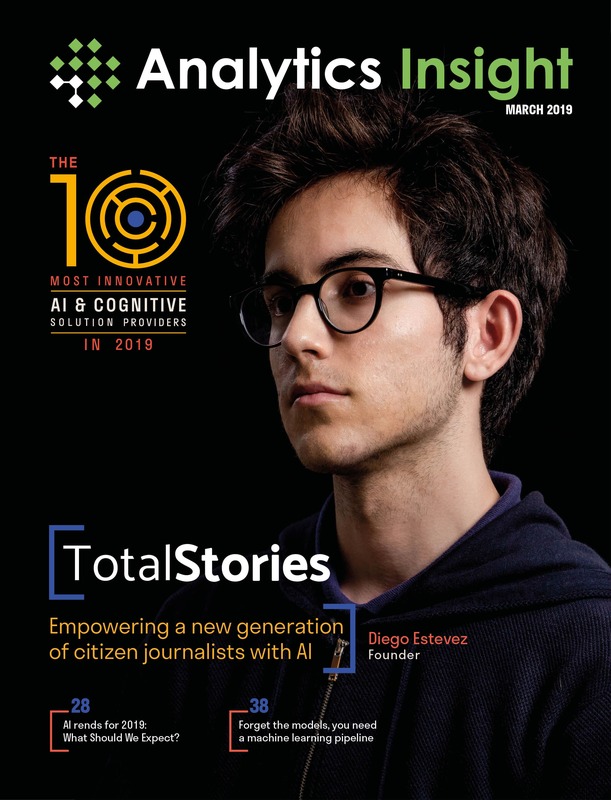 SAN JOSE, California and HYDERABAD, India, April 3, 2019 /PRNewswire/ -- Analytics Insight Magazine, a brand of Stravium Intelligence has named 'The 10 Most Innovative AI and Cognitive Solution Providers in 2019' in its March issue. TotalStories: Featured as the magazine Cover Story is TotalStories. The company offers a platform that aims to give everyone the tools to share meaningful information about the world, and then make it easier for readers to find it. It uses AI to determine the quality of news, and then to classify and recommend them to people based on what matters to them. Forcive: Recognized as the Company of the Month, Forcive is an innovative and integrated data platform that offers a wide range of functions and components required to operationalize the data processing with algorithms under a unified concept, overcoming the many complexities and obstacles that hinder the success of any real production-ready and viable solution. DeepCoding: A cutting-edge Operational Intelligence company which uses innovative AI technologies to predict IT delivery risks before they happen, measure their expected business impact, and suggest mitigation options in the form of targeted alerts and daily briefs. Deep Vision: Excels at providing intelligent image and video analysis that facilitates new ways of understanding and analyzing visual data. It provides AI-vision to a broad set of partners and clients to help them operate more efficiently and effectively. Directly: An emerging leader in CX Automation, helping companies deliver better customer service at scale while creating economic opportunity for people. The platform allows a brand's expert users to identify gaps in self-service content and deliver instant answers. Guavus: Provides Guavus Reflex Analytics Fabric, (RAF) which makes the development, deployment, and operation of machine learning based applications simple and fast. It offers a specific CSP analytics applications for network operations, customer care and marketing. Ingedata: A smart outsourcing agency which proposes industrialized services to structure and prepare datasets that are used to train computer vision and NLP models. The company implements client-specific production lines for dataset annotation. PYCO: A personality AI science company which has invented an intelligence algorithm that reveals every individual's personality type instantly. The entire process runs using data science, machine learning, deep learning, and AI techniques. Spoon Guru: A fast-growing tech startup enabling retailers to deliver highly personalized shopping experiences tailored to every consumer, based on their distinct and unique dietary needs – increasing the choice of foods available, whilst minimizing the effort to find them. Yva: An AI-powered employee engagement and performance platform that combines Pulse and 360-degree surveys with AI analysis of corporate emails and messages, supporting Microsoft Office 365/Outlook, G Suite/Gmail, Slack and more. Artificial intelligence has gone from futuristic vision to near-mainstream function at many large organizations and their innovation labs. AI is increasingly driving important developments in technology and business today. It is improving fast and helping enterprises develop new solutions which evolve into major revenue streams. "We congratulate all the ten companies for delivering world-class AI solutions which help enterprises to bring a new breed of innovations, pushing the capabilities to the edge for both businesses and the economy", says Ashish Sukhadeve, Founder & Editor-in-Chief, Analytics Insight. Analytics Insight is an influential platform dedicated to insights, trends, and opinion from the world of data-driven technologies. It monitors developments, recognition, and achievements made by AI, big data and analytics companies across the globe. The Analytics Insight Magazine features opinions and views from top leaders and executives in the industry who share their journey, experiences, success stories, and knowledge to grow profitable businesses.